Almond Butter Chocolate Chip or Walnut-Chocolate, which would you choose? Gluten-free, Vegan, No Bake & YUMMY! Our freezer is always stocked with our two favorite bliss balls… they are the perfect grab and go snack any time of day. 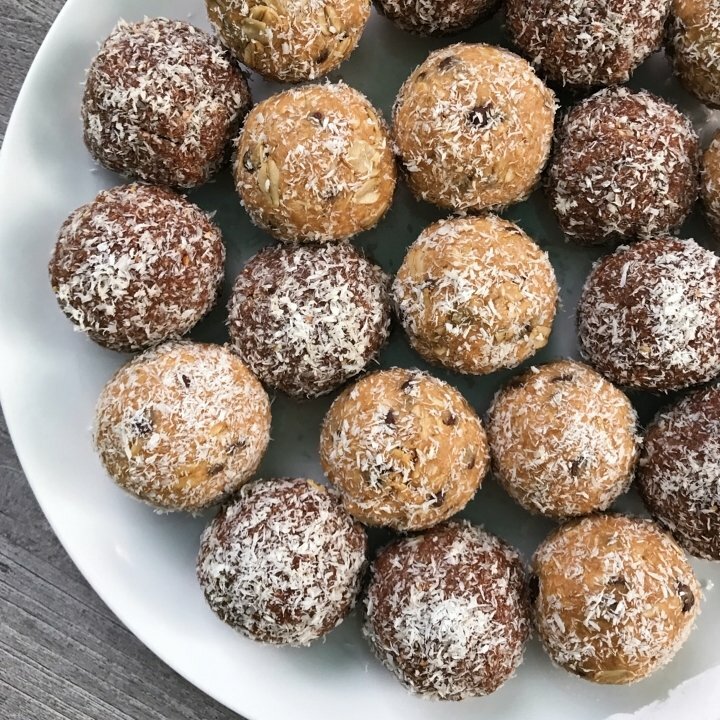 The Almond Butter Chocolate Chip Bliss Balls are just five ingredients – Barney Butter almond butter, gluten-free oats, maple syrup, mini-chips and shredded coconut. Recipe adapted from The Stand Juice. The Walnut-Chocolate bliss balls are made with walnuts, dates, Barney Butter almond butter, gluten-free oats, mini-chips, maple syrup and vanilla. Recipe adapted from Alicia Silverstone’s The Kind Life. Packed with nutrients and delicious, they the perfect energy boost and we’ve been known to eat them at breakfast, pre- or post-workouts, for snacks or dessert. Both are made with our favorite almond butter — Barney Butter Smooth Almond Butter! We are Barney Butter Brand Ambassadors.